238 pages | 16 B/W Illus. Collectively, the essays form a solid foundation on which to understand the different roles language plays in the conduct of politics, the way in which these roles are performed in various situations in different societies and cultures, and the political outcomes of verbal behavior. 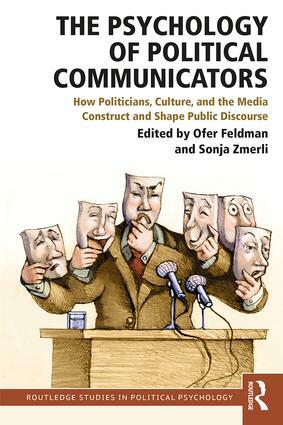 This book will be of interest to scholars and students of political psychology and communication studies. Ofer Feldman is a Professor of Political Psychology and Behavior at the Faculty of Policy Studies, Doshisha University, Kyoto, Japan. He is the author of more than 90 journal articles and book chapters, and more than 100 encyclopedia items, in the fields of political psychology/behavior, communication studies, and Japanese politics, and the sole author, sole editor, and co-editor of 15 books and monographs, including Talking Politics in Japan Today (2004), Seiji shinrigaku [Political Psychology] (in Japanese, 2006), and the Politische Psychologie: Handbuch für Studium und Wissenschaft [Political Psychology: Handbook for Study and Science] (in German, 2015, with Sonja Zmerli). Sonja Zmerli is Professor of Political Science at the Institut d’Études Politiques de Grenoble, France. Her research interests revolve around social capital, civil society, political support, income inequality, and welfare regimes. Her articles have appeared in Public Opinion Quarterly, European Political Science Review, American Behavioral Scientist, and Social Science Research. Most recently, she has co-edited the Handbook on Political Trust (2017, with Tom van der Meer). Please click here to access supplemental references.